Planet Ark's 2015 research, sponsored by Toyota, investigates how contact with nature affects people’s life-long happiness and the physiological impacts it has on the brain. The surveys included in the report used internationally-recognised scales to measure the connection to nature and happiness of participants. The report found that spending time in nature influences our subjective wellbeing, which has long-term health and financial consequences for Australians in light of our significantly reduced time in nature over the past generation. With today’s children spending more time inside and on screens than ever, we may be setting them up to become “the unhappy generation”. Children who engage in just one third more outdoor activities than their peers grow up to be happier adults. Nature has the ability to influence happiness because it has direct and positive effects on the brain and the body’s hormone response to stress. Exposing children to environments that reduce stress and increase wellbeing has long-term effects on the structure of the brain and happiness later in life. Three out of four adults played outdoors more often than indoors when they were young, compared to only one in ten children today. Over the space of a single generation Australians have disconnected from nature, while at the same time there has been a rapid increase in levels of stress and depression, with depression-associated disability costing the Australian economy $14.9 billion a year. Needing Trees builds upon previous research commissioned by Planet Ark that highlighted the value and importance of contact with nature for our health, wellbeing and development. 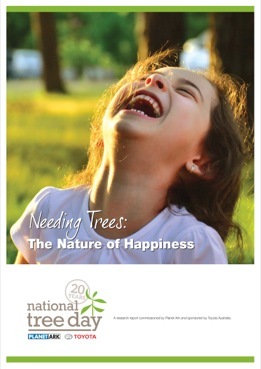 2014 - Valuing Trees: What is Nature Worth?